For many business owners, the holiday season is the most hectic time of the year. Constant Contact customers sent over one billion emails in the week leading up to Cyber Monday. You know that sending timely emails during major shopping days like Black Friday (November 23, 2018), Small Business Saturday (November 24, 2018), and Cyber Monday (November 26, 2018) is a great way to drive holiday sales and delight customers. But how can you make sure your holiday messages will stand out and drive action? Most importantly, how can you make time for marketing as things get busier and busier at your business? Successful holiday marketing means planning a strategy for your specific audience, optimizing your message with industry best practices in mind, and preparing ahead of time whenever you can. Use this three-step plan to deliver effective emails to your audience and avoid the usual holiday headaches. Start your planning process by thinking about your customer base. Who are they? What motivates them? And how can you reach them effectively? With the number of emails consumers are receiving during the busy holiday months, you want to go beyond the sending basics and look for opportunities to target messages to different groups of people on your list. 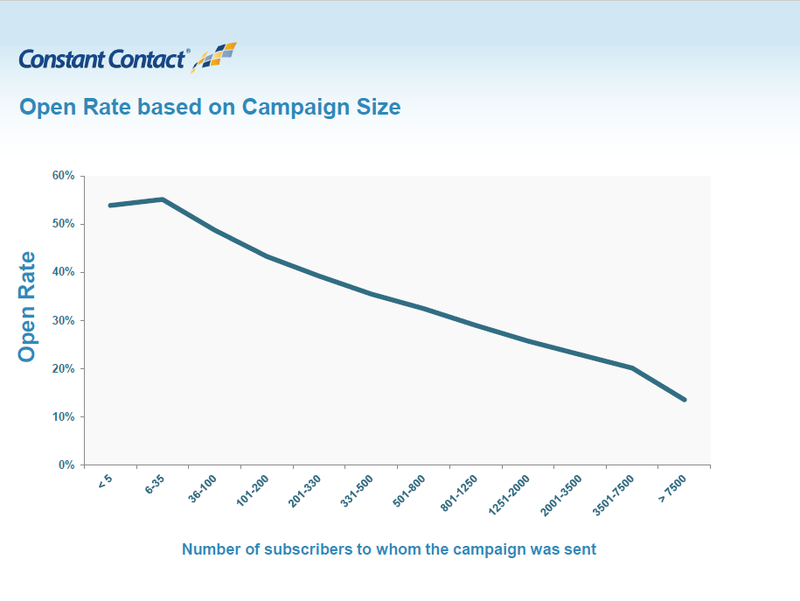 A study from Constant Contact showed that campaigns sent to a smaller group of contacts result in significantly higher open rates. By targeting a smaller group of customers, your message is more personal and therefore, customers are more likely to engage. How can you segment your list during the holiday season? Holiday shoppers often fall into two distinct groups: those who buy ahead of time, and those who wait until the last minute. Make sure you’re appealing to both by coming up with a schedule and sending a special offer both early in the season and down to the wire. Use your reports to make a list of the people who act on your offer early on — you can send them a thank you email with a different offer later in the season. And be sure to follow up with those who didn’t act the first time; they might just need another reminder before they’re ready to buy. When creating your email marketing message, sometimes it’s hard to know where to begin. Fortunately, there are best practices to use as a foundation if you’re feeling stuck. 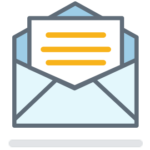 Subject lines: 50 characters (or fewer) is the perfect length to catch the attention of your subscribers. Make sure to emphasize the first 32-40 characters, as many mobile inboxes will cut the subject line off after 32 characters. Length of text: Keep your message concise so your readers can consume your message quickly and easily. About 20 lines of text is the sweet spot for many industries, but the most important thing is to have a clear call to action so your subscribers know how to act on your message. Colors and fonts: Even during festive times of the year, it’s important to use some restraint. Stick to three colors or less and a maximum of four fonts — too many colors and fonts will be distracting to your readers and take away from your message. With these tips in mind, think about how you can create an email that will stand out and persuade your subscribers to take action. If you need a little extra inspiration, here are 30 creative email ideas for your holiday email marketing. Once you have a plan in place for the messages you want to send this year, get started creating your messages ahead of time and schedule them in advance. 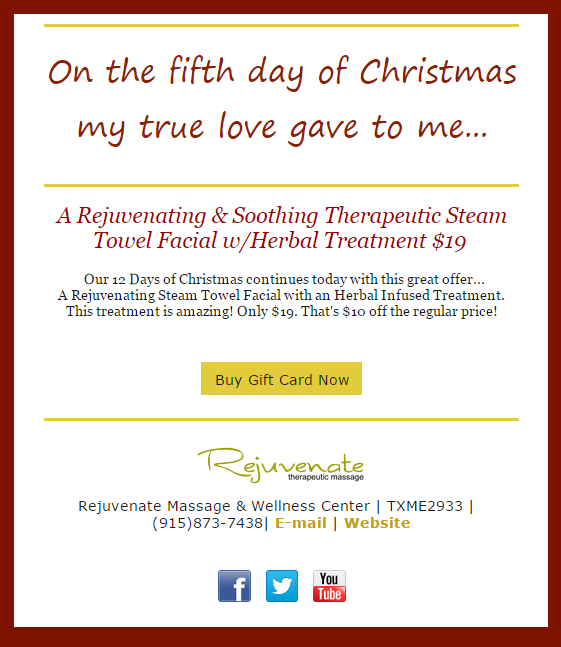 Last year, Victor Terrazas from Rejuvenate Therapeutic Massage sent his email list a series of messages with gift-giving ideas to drive end-of-year sales. Think about how you can try something similar at your business this year by sending messages around the shopping holidays. With these three tips, you can prepare for the holiday season early and give yourself the gift of a bustling — but not frantic — holiday season. For more holiday marketing inspiration, check out 28 Ideas for Your Holiday Email Marketing. Public Relations intern at @ConstantContact and NFL enthusiast.